It was a pleasure being able to experience Calabash Cove Resort & Spa in the year of its 10th Anniversary. The reviews all rave about this very cozy 26 room boutique hotel, tucked away with views that make you never want to leave. So just like the many guests who’ve decided to book this resort, we decided why not try the Calabash Cove Experience! Heading to Calabash Cove; the ride is a bit bumpy, one would think they were heading on a different type of adventure. Before we were halfway there, we started wondering if we were heading in the right direction— something common with hideaway resorts in St. Lucia— looking back now, we wonder if this was all part of the Experience. 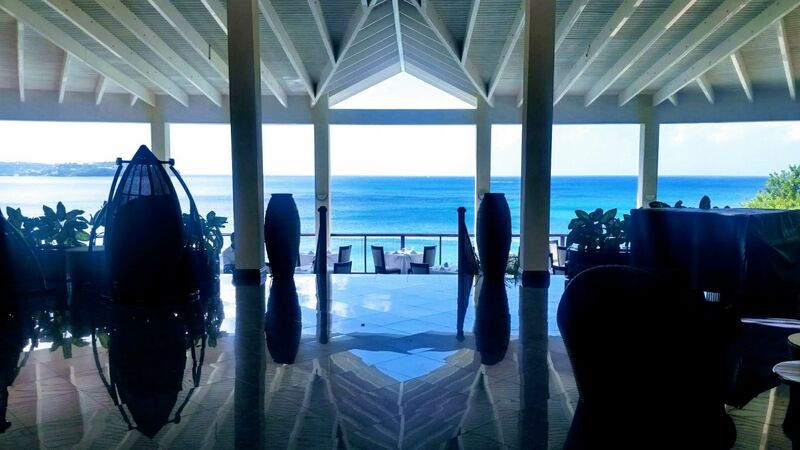 Once we made it past security and into reception/lounge area we were immediately awestruck by the glorious stretched view of the Caribbean Sea. 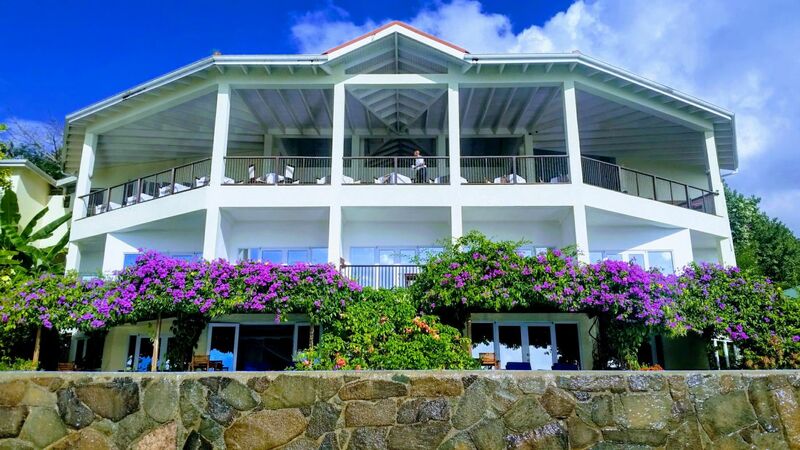 The all-inclusive couples only resort is nicely hidden among palm & coconut trees with many local fruits and vegetables blooming in almost every corner of the hotel. Once a family resort, Calabash Cove got its name due to several Calabash trees which were found on the site despite it being otherwise very barren. It’s a fitting name of course. You might get the feeling of being in the Caribbean & Bali as much of the construction for Calabash Cove was inspired by the Balinese culture. Most impressive is that the rooms & other parts of the hotel walls are adorned with paintings from local artists as well as much of the woodwork being done by local craftsmen. All throughout are wood furnishings & finishings and bamboo which gives the hotel a natural & light rusty finishing with hints of reds and blues, taking away from the industrial feel that might come with other resorts. One of our favorite spaces is called “Whispers”. Officially, it acts as the home to the Swedish & Austrian Consulate, but don’t let that deter you from entering— as what awaits inside is a simple oasis designed to cater to music lovers, book lovers and those who want a getaway… from a getaway! We couldn’t help but noticed the many sitting spots available around the resort. From Adirondack to hanging basket chairs; snugged cushion sofas & more. They’re ideal for cozying up & reading one of the many books that can be found at Whispers or do nothing at all while basking in all that lays before you – views, views & more views. The panorama makes it quite a task trying to focus on achieving anything else. Then again, one didn’t really come to do much of anything but be spoiled and pampered in the most lavish way. With 26 rooms, there are three (3) room categories to choose from, each gracing you with a view of the Caribbean Sea & the city of Castries. Upon entering the rooms, you’re instantly hit with splashes of colors reflecting the tropical aspects of the Caribbean, yet can also see the hints of other influences around the room & the remainder of the hotel. All are air-conditioned & spacious, with gracious enough wardrobe and drawer spaces in addition to bathrobes, slippers & a safe; ample sized bathtubs for those romantic baths along with Verde toiletries; flat screen TVs (but who has time to watch tv anyway with so much to indulge in here?) and what many love – the Four Poster King sized bed with mosquito netting and the fully stocked bar. Swim Up Jr. Suite that leads straight into the infinity pool making them ideal for enjoying sunsets! At Calabash Cove, it doesn’t seem to only be about personalization and ensuring that every guest has an authentic and deep experience, but also helping them to live and lead a healthier lifestyle. They’re invested in being an eco-friendly environment; using solar panels, recycling and staying away from harmful chemicals & materials. With such initiatives, they’ve created an oasis on every inch of the resort, making it difficult to decide if to spend the time indoors or outdoors. Flowers cascade down the walls; overhead trellis; caterpillars lounging on the leaves; hummingbirds pecking at flower buds; gentle winds & so much more. Walking around, a certain peace emanates from the environment and with every step the sweetest, yet soothing smell penetrates your senses, even in the rooms & hallways! 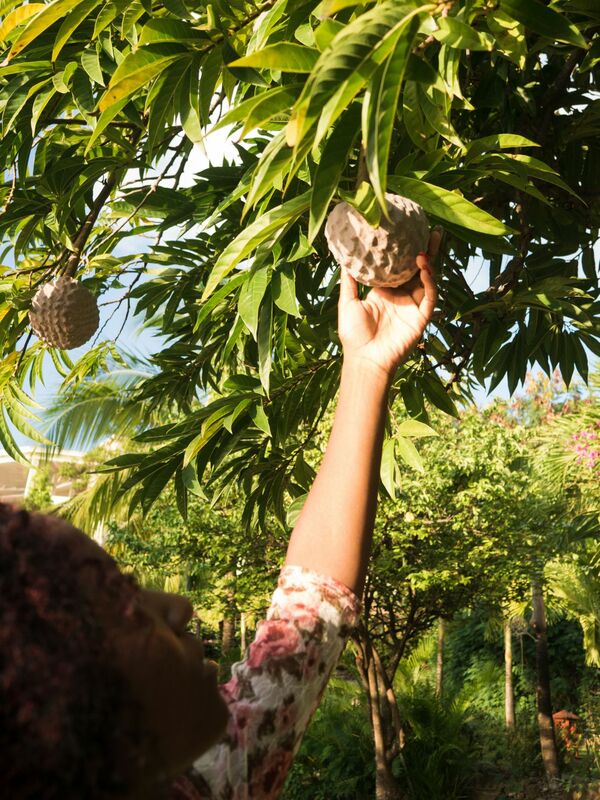 We couldn’t help but notice the array of fruit trees such as tamarind, mangoes, pineapples, even Jamaican ackee & more dotted around the resort. Ever heard of Sugar Custard Apple? We hadn’t either. All the flowering plants and trees were sourced in the vicinity and grown from seedlings in a greenhouse during construction. The fruits & herbs aren’t just for show, they’re incorporated into the daily meals, being a testament to Calabash Cove Resort & Spa being more than the average all-inclusive resort. 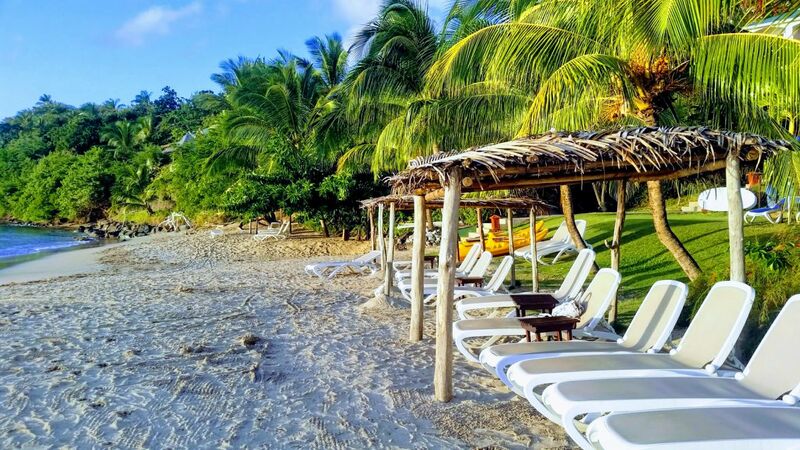 Calabash Cove is blessed to have a secluded and undisturbed beach (though not private as all beaches in St. Lucia are public) that is able to cater to those who favor privacy & quietness. Here, the views extend to the city of Castries and Vigie and at sunset, it’s a great location to watch the city come to life with lights. One could call it a day and unwind on the beach chairs under the coconut leaves shelter or take a stroll onto the wooden pier. Roped railings lead to a raised sitting area where the winds blow gently and all that can be heard are the sounds of the waves beating against the rocks. The pier, along with the turquoise and royal blue mixture of the waters, sets the scene for an intimate dinner, a sunset wedding or do like we did – indulge in a cold Piton beer as the sun starts to paint the sky in a hue of colors. 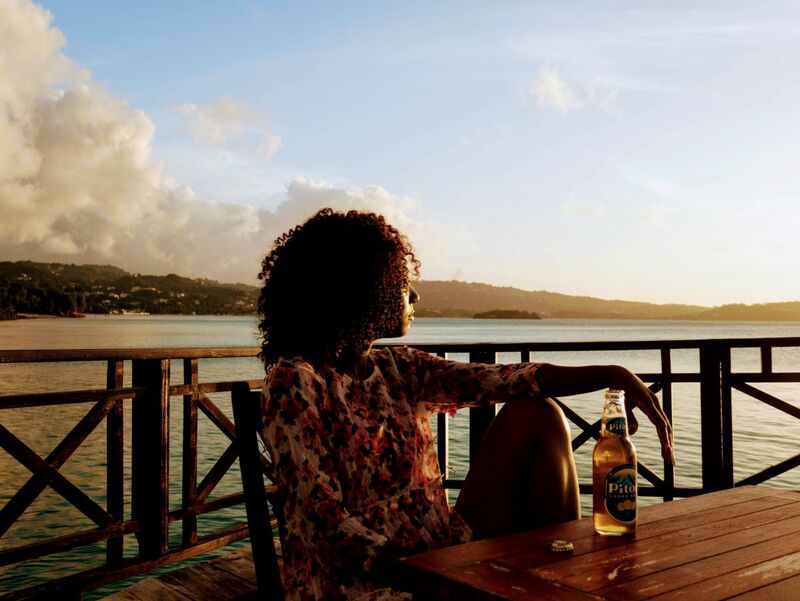 Piton beer is St. Lucia’s national beer; so it’s only fitting that we enjoy the best of the best at one of the best! Today many resorts offer both motorized & non-motorized sports yet Calabash Cove continues to soar even though they only offer guest non-motorized sports which include paddle board and kayaking. Ti Spa is a small space that offers European inspired techniques and locally made body scrubs. Treatments are done inside one of their two (2) rooms. The rooms aren’t as spacious for those like myself who prefer wide open spaces so I’d definitely take advantage of their other outside options; the gazebo or on the beach. There is also a nail spa for those who enjoy a good mani and pedi. It’s housed in an enclosed space behind a wide glass mirror which is brilliant because it prevents the smell of the nail polish from spreading around the spa. The space is minimalist and not as impressive as the other parts of the hotel. We appreciate the use of locally made scrubs, it’s good to know that local products are being supported. Miguel, who was present did an amazing job of welcoming and educating us on these scrubs and when they should be used. Before exiting Ti Spa is a door straight ahead that leads to a gym. 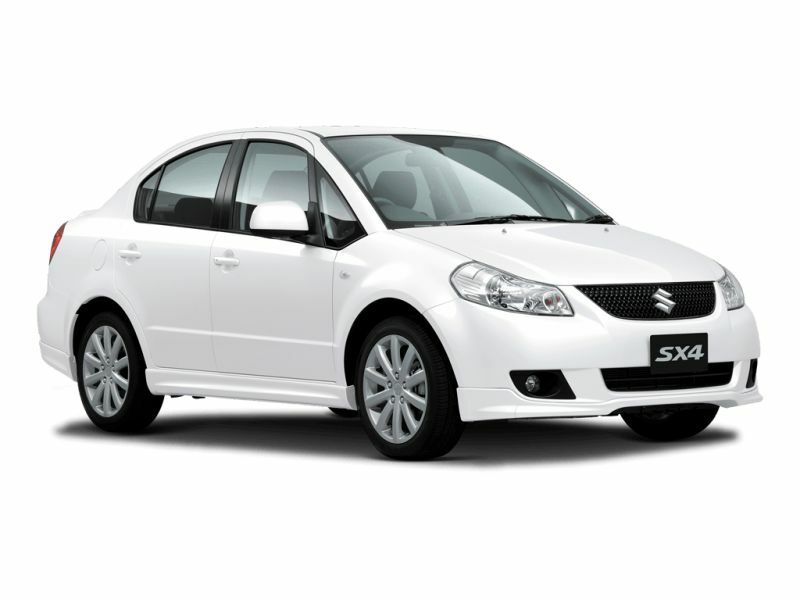 It’s furnished with adequate up-to-date machines & material as well as air conditioned! We’re not sure whether any workouts would get done as they’ve placed the machines in such a way that your view is of the Caribbean Sea. Diavolo! We think they did that on purpose! With only one pool— it still doesn’t feel crowded and being able to swim up to the bar is very convenient. Our recommended drink is the Mango Tango, it’s made from Mango Mix, Lime Juice, Grenadine, Bounty Rum, Banana and a small dash of Coconut Cream. It’s a refreshing slush with a light dash of alcohol. Something which caught our attention here was the barmen and their genuine interest in knowing about us personally and the other guests to ensure we have a pleasant experience. The love for their jobs could clearly be seen and they made it their duty in ensuring that whoever they were serving was well taken care of & entertained! This was evident by staff throughout the resort. We didn’t get a “local” treatment, which are scenarios where locals might be treated with less care (?) than visitors to the island. This could not be more evident than at dinner time and we commend this resort for that! They don’t have a “Signature Drink”. We were really looking forward to having a drink called “The Calabash” or something that would represent the essence of Calabash Cove. Maybe something fruity with coconut water and a dash of one of our local rums served in a Calabash which is actually the national tree of St. Lucia. Who knows, maybe in the near future. There are only two bars; one near the pool, C Bar and the other upstairs near the restaurant. At times, the bartenders weren’t there to serve us as they were around either making room orders or other errands. Still, worth the short wait, We’d say. Dinner at their Windsong Restaurant was truly superb. Calabash Cove is a bijou resort so it’s no surprise that only one restaurant caters to all guests. 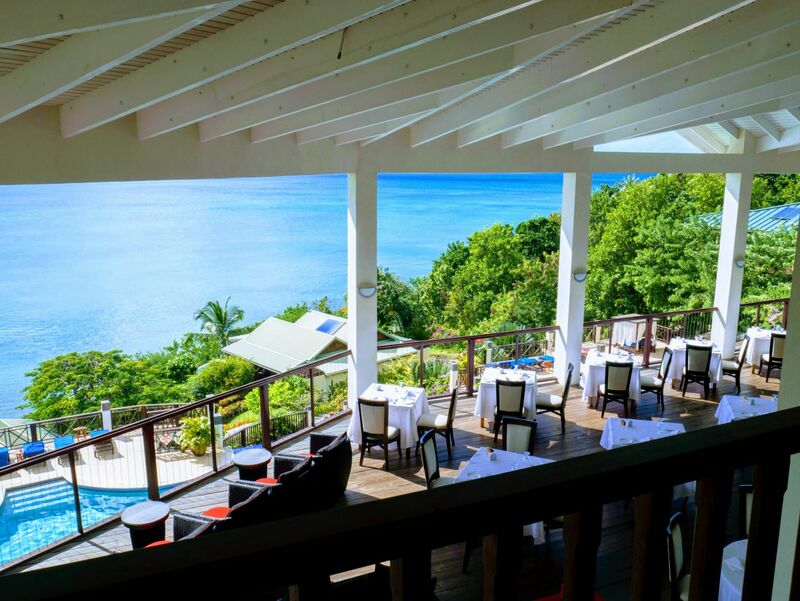 Distinctive to Windsong Restaurant and sets them completely apart from many other all-inclusive resorts is their menu, or should we say menus? Yes, a daily changing menu. With one restaurant we have to keep up so we change it up every day. So if you’re thinking that one restaurant limits the variety of foods one can enjoy at a resort, Calabash Cove disproves that theory. Another aspect that’s always incorporated into their dishes are the fruits, vegetables & herbs from their very own garden. This way, the flavors aren’t compromised; guests know what goes into their dishes and the resort grounds are used to their maximum potential. Think of it as a farm to table kind of restaurant. Dinner starts from 7:00 pm and it was the absolute highlight of the day as both the food and the attentiveness of the staff surpassed our expectations. With such a wide selection, we decided to trust the expertise of those on duty to guide us to the dishes which would fit our palette best. It’s refreshing to be assisted by staff who can actually recommend dishes to you simply based off telling them what your style and preference is and furthermore, they were completely confident about the choices being given. They don’t go easy on the wines either. With over 22 wines to wet your palette, it’s absolute nirvana for those who consider themselves to be a “sommelier”. If you’re not, we’d recommend starting out your “sommelier” career at this resort. When Calabash Cove says all-inclusive, they really do mean all-inclusive. Guests don’t have to worry about paying service/support or supplements charges, which are extra costs associated with certain foods such as lobster. That means you can devour as much from the menu as you’d like and nothing extra would be added to your tab. That’s a pretty good enough incentive to go all in! While waiting for your meal over the sound of live music and the scintillating lights of the city, you’ll be served an Amuse-bouche which is a complimentary bite that the chef concocts. It prepared us for the course ahead, by increasing our appetite and definitely showing off the creative skills of the chef. The Amuse-bouche this time around was a Salmon and Cream Cheese Mousse which was whipped up and propped on lightly toasted white bread which complemented the fluffiness of the mousse. Open Face Seafood Ravioli– Served with braised fennel, caper berries & tomato jam. Sesame Crusted Ahi Tuna– Served on an organic salad with sweet corn, avocado and banana crisp on a plum & passionfruit reduction. St. Lucian Sea Trout Fillet- Pan seared sea trout with a vegetable and Chorizo Risotto on a corn & clam sauce. Grilled Cajun Half Lobster- With basmati rice, market vegetables & garlic butter sauce (Taken from the Daily Menu). Caramelized Plum & Soursop Duck Breast- Served on glass noodles and tempura vegetables (zucchini, cauliflower & broccoli) drizzled with teriyaki & papaya sauce. Calabash Ylang Ylang Crème brûlée- With coconut tuile. Needless to say, everything was absolutely delicious but if you decide to visit Calabash Cove then you can’t pass over the opportunity to savor this special Crème brûlée in particular. It’s made with the Ylang Ylang tree grown at the resort. The aroma of the Ylang Ylang comes through the hardened caramelized sugar and the custard is truly superb. The perfume taste of the Ylang Ylang plant, however, does not linger on the taste buds as expected which can either be preferable or not, depending on your tastes. Dinner was feast enjoyed in a light-heartened environment thanks to the staff who were amicable, funny, knowledgeable & made each table feel as if they were their only priority. The staff at Calabash Cove Resort & Spa really makes the whole experience stand out. We read the reviews & heard amazing tales about Calabash Cove Resort & Spa from others, but now we wanted to hear directly from the staff what they believed made Calabash Cove a five-star resort. They all sang the same praise – those who they work with. Mr. Wagner has done an amazing job – from construction to running the resort and having it be where it is today. We have a lot of repeat clients and we’re very proud of that. They come back simply because of the way our staff takes care of them. But what makes this family, as he refers to them, work so diligently and faithfully at their duties? Because everyone who comes in is given a chance to grow and elevate. We couldn’t agree more as we witnessed it firsthand. Those who we encountered were helpful, courteous, lively, engaging and respectful. But that’s not the only thing that puts Calabash Cove as a five-star resort in our book. Internships for the different hospitality schools among a host of other activities. Calabash Cove Resort & Spa has proven that small doesn’t mean that one has to compromise on quality. Sometimes the less, the better; leaving room for specialization and extreme attention to detail; ensuring that all who come to have a “Calabash Experience” leave fulfilled and rejuvenated. We certainly left fulfilled and a little sad to leave this amazing resort and can now boldly testify that Calabash Cove Resort & Spa is a class in itself that takes pride in providing the best to their guests. Thank you for sharing your cove with us. We can’t wait to return & see what Chef Paul comes up with for the daily menu! We were provided free accommodation and invitation to Calabash Cove Resort & Spa. All thoughts and opinions expressed in this piece are our own.